Steven Avery and Brendan Dassey's murder conviction for the death of photographer Teresa Halbech captivated audiences around the world thanks to the Netflix documentary series, Making A Murderer. 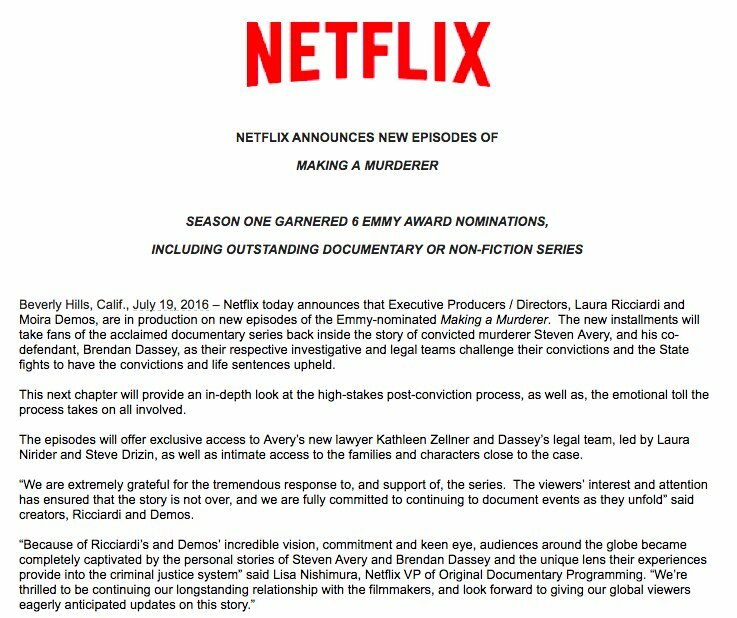 After earning an Emmy nomination for Outstanding Documentary or Nonfiction Series, Making A Murderer Season 2 has been confirmed by Netflix to draw fans even deeper into the world of this case. However, as exciting as this news may be, the documentary series' directors and producers, Laura Ricciardi and Moira Demos, still have a ton of work ahead of them. That may leave many fans wondering one thing: When will Season 2 of Making A Murderer premiere? The next chapter will provide an in-depth look at the high-stakes post-conviction process, as well as, the emotional toll the process takes on all involved. The episodes will offer exclusive access into Avery's new lawyer Kathleen Zellner Dassey's legal team, led by Laura Nirider and Steve Drizin, as well as intimate access to the families and characters close to the case. However, when taking the first season into consideration, the December 18, 2015 premiere of the series came about two years after Netflix originally picked up Ricciardi and Demos' idea in 2013. With two years of a deal, and years of footage before that to back them up, there was certainly a lot more to draw from in regards to piecing the first 10 episode season together. But now, the documentary filmmakers must reassess the parts of the story that they covered the first time, while also looking forward to uncover more in real-time. Basically, the second season will be a lengthier, and much different, production process. I'm giving them at least another year before a premiere date, but I'm perfectly fine with them taking some time. The more they can uncover and dive into, the more intriguing the continuation of the story may become.